The portable, ambidextrous ThinkPad Bluetooth Laser Mouse is perfect for anyone looking for a compact mouse to use everyday and while on-the-go with their Bluetooth-enabled desktop or notebook system. 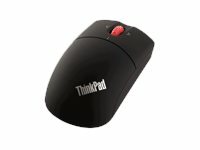 The ThinkPad Bluetooth Laser Mouse eliminates the cord and delivers extraordinary control on virtually any surface. Scroll through documents, spreadsheets, and more with increased accuracy and control with its high definition laser sensor and tilting scroll wheel. An advanced power management system, a high efficiency laser sensor, and an off switch help to maximize your battery life.